Panera is a restaurant that many smart eaters visit because of the fresh and healthy menu. 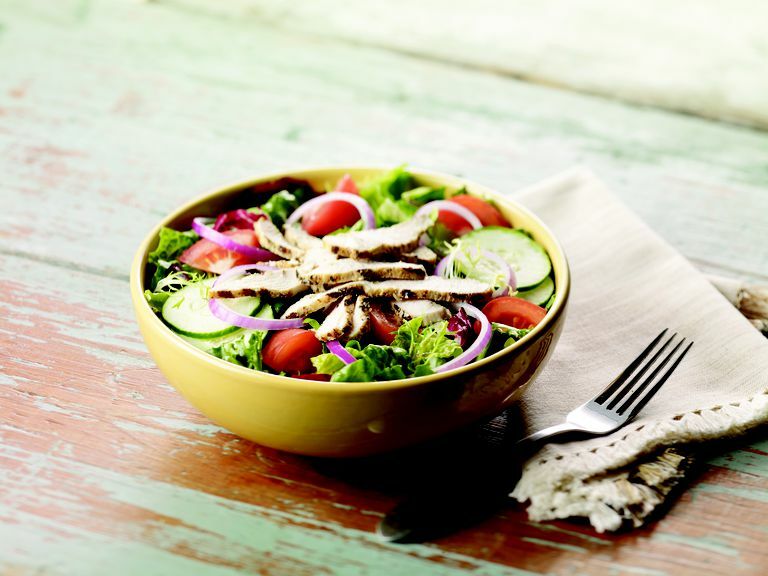 If you're trying to reach or maintain a healthy weight, the Panera Bread menu provides plenty of nutritious options. Panera's menu is full of fresh sandwiches, soups, and salads. The range of choices is broad and the ingredients are quite diverse. This is not a restaurant where you'll find typical fried fast food fare like hamburgers or French fries. Instead, most items on the Panera menu are grilled or baked. Panera also provides a wide range of choices for diners with special nutritional needs. There are items for vegans, vegetarians, low-sodium, gluten-conscious and high-protein eaters. The company is committed to serving food that does not contain artificial preservatives, flavors or sweeteners , and colors from artificial sources. But not everything on the Panera menu is low in calories or low in fat. And this might be a tough restaurant choice for low carb dieters. Panera is known for its bread and many of the breads are relatively high in calories and very high in carbs. Broccoli Cheddar Soup is one of the more popular choices. Unfortunately, however, it's not a very healthy menu choice. It is very high in fat, high in saturated fat and even provides a gram of trans fat. And even though you will get 6 grams of fiber in the meal, it comes with 6 grams of sugar and a whopping 1330 milligrams of sodium. Keep in mind that the nutrition facts provided are for a traditional bowl of Broccoli Cheddar Soup. If you get the bread bowl, the calorie count skyrockets to 890, and you'll consume 2180 milligrams of sodium. If you enjoy soup, consider the low fat Chicken Noodle Soup (160 calories) or the Turkey Chili (260 calories). So what items does she recommend? She suggested a few Panera Bread menu items to try. If you’re trying to lose weight, there are foods on every menu that you should avoid. At Panera, these might include creamy items like Macaroni and Cheese (980 calories), or New England Clam Chowder (720 calories). Several of the paninis are also very high in calories. The Steak and White Cheddar Panini (1050 calories) and Chipotle Chicken Panini (840 calories) are probably good items to avoid unless you can eat a small portion and be satisfied. The beverage choices at Panera Bread can help you to stick to a healthy eating plan as long as you use the information that is provided when you order your drink. If you order one of Panera's craft beverages—including non-carbonated teas, lemonades, and frescas—you'll see information posted in the restaurant and online about the calorie content and sugar content of the drink. The information is there to help you make a choice that fits your tastes and needs, and Panera is one of the first to publicize the ingredients and added sugar content of their drinks. When it comes to sugar, some beverage choices contain no added sugar while others contain far less than traditional sodas and other sweetened beverages. Panera's offerings are categorized by a range of sweetness, from unsweetened to medium sweetened, based on a regular 20 fluid ounce cup without ice. Unsweetened beverages: Both the Plum Ginger Hibiscus Tea and the Unsweetened Iced Black Tea are zero-calorie drinks and provide no added sugar. The drinks are smart choices for diners who are trying to cut calories or reduce their sugar intake. Lightly sweetened beverages: Prickly Pear Hibiscus Fresca provides zero grams of added sugar, but this drink is made with fruit concentrate, so it does contain 20 grams of sugar. However, since most soft drinks contain far more added sugar (Pepsi, for example, contains 69 grams of added sugar) and no nutritional benefit, a drink made with fruit juice is still a smarter option. Medium sweetened beverages: Passion Papaya Green Tea, Agave Lemonade, and Blood Orange Lemonade (which contains fruit, carrots, and turmeric) provide up to 34 grams of added sugar. It's higher than the other choices, but still less than fully sweetened soft drinks with up to 75 grams of added sugar, and it's made from better-for-you ingredients. You can visit Panera Bread, enjoy a satisfying meal and stick to your diet. Simply plan in advance. There are plenty of diet-friendly Panera menu items, but some that probably aren’t the best foods to support your weight loss program. Check the menu online or download the app before you go to choose foods that are both satisfying and low in calories. Panera Bread Nutrition Information - US.